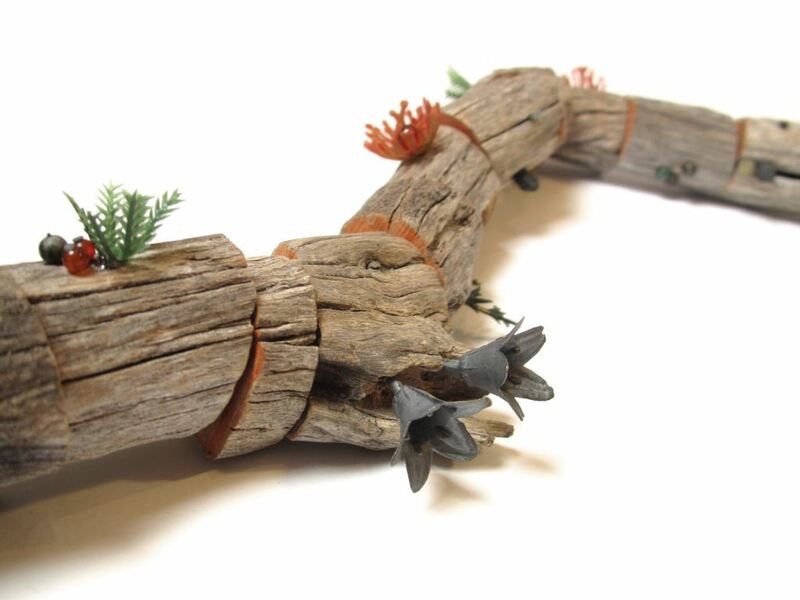 Melinda Young, _Arborescence_ (detail), 2012, Found wood, artificial plant foliage, oxidised 925 silver, ruby, garnet carnelian, jasper, labradorite, aventurine, jade, smoky quartz, tourmaline, opal, stone, glass, paint, waxed linen thread. Installation view Craft ACT, 2012. Image courtesy Craft ACT. 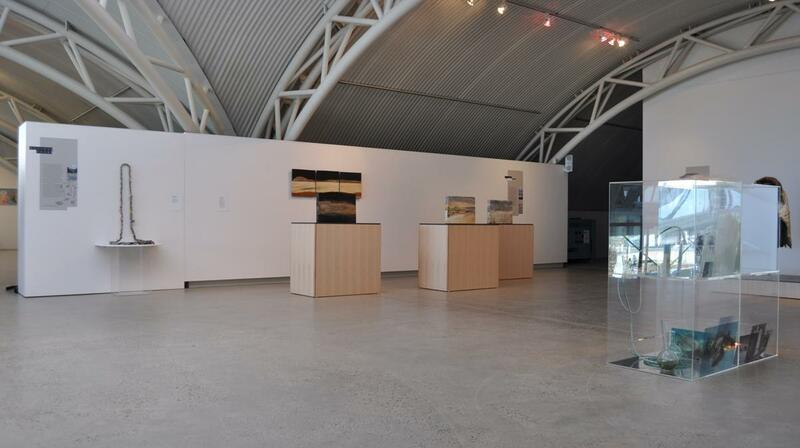 Installation view Signal Point Gallery, 2012. Image courtesy Signal Point Gallery. Life in Your Hands: art from solastalgia championed visual art, craft and design as an enabling force to combat solastalgia. Environmental stresses can adversely affect the mental health of communities, to the extent where there is a loss of connection between the community and the environment that has historically sustained it. The phenomenon was recognised and identified as ‘solastalgia’, by Professor Prof. Glenn Albrecht: ‘the homesickness you have when you haven’t left home’. Unlike major catastrophes where a cause can be identified and collectively addressed, with solastalgia the change is chronic and incremental, and as a result is often not recognised. Groups of individuals become ‘disturbed’ by solastalgia but, as it is not sudden and traumatic, a response is not always recognised as being necessary. Responding to this compelling issue, artists were asked to consult directly with communities identified as suffering from solastalgia to create artworks for the exhibition Life in Your Hands. Through their work, the artists provided communities with a voice and an avenue of personal action, commenting on, recreating and forging new links, where communication has been lost. The resultant artworks, comprising jewellery, ceramics, textiles, photography, video and installation, are at once optimistic of the future, and cautionary about the consequences if action is not taken. Unless a resolution is found to recognise and understand solastalgia and the effect it has on communities, groups of individuals will become increasingly incapacitated and distanced from their environment and community. 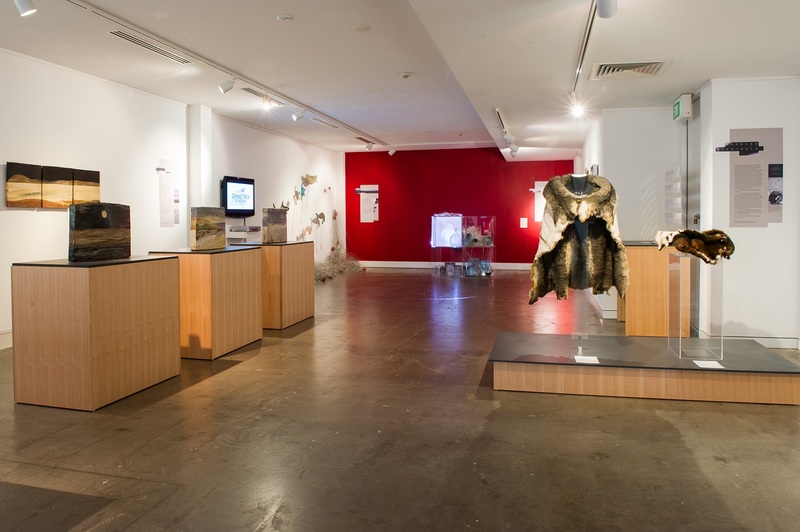 A Lake Macquarie City Art Gallery project curated by Robyn Daw, touring to six venues across Australia with Museums & Galleries of NSW, supported by the Contemporary Touring Initiative.